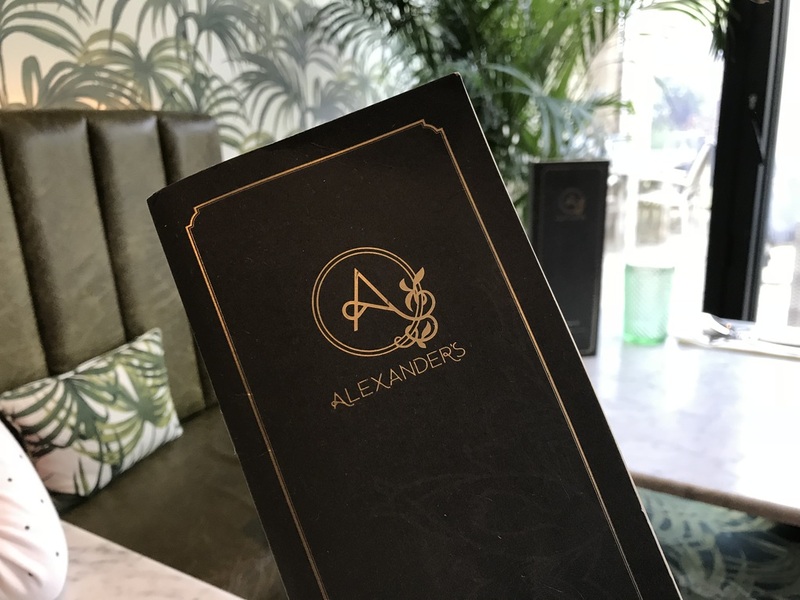 We had a gorgeous time when we travelled across to Skipton for a spot of Brunch at Alexander’s with the Smalls during the Easter holidays. 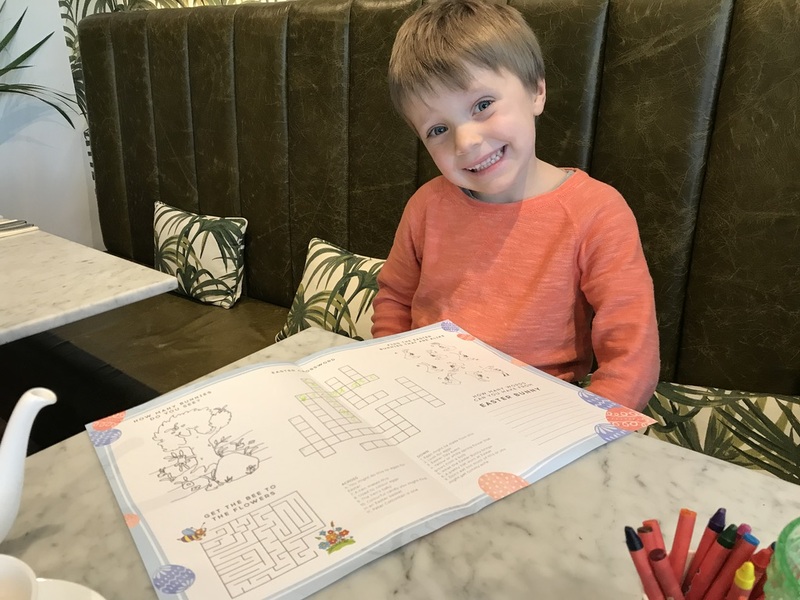 It was so lovely to find a new restaurant that ticks all the family friendly boxes. 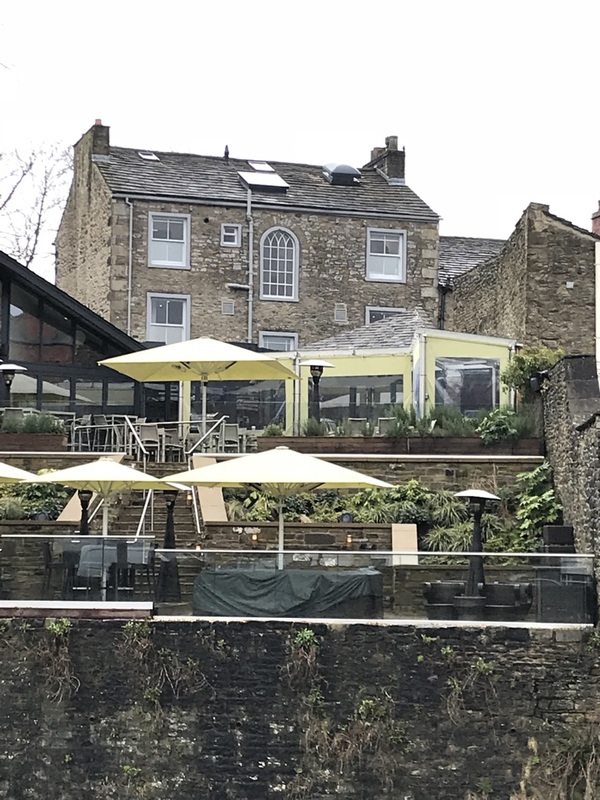 We head over Skipton way fairly often, whether it’s to visit Bolton Abbey or Hesketh Farm Park or just to explore the Yorkshire Dales a little more, so finding somewhere new to eat over that way was a big bonus! Skipton is really lovely too – it’s bigger than I remember and would be worth a good look around one day too. I hear great things about Skipton Castle as well – which is also on our family to do list! 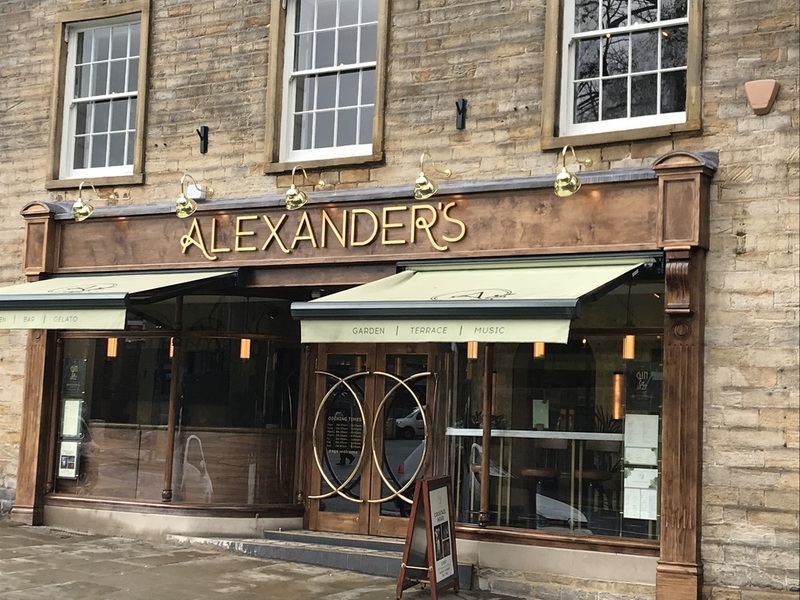 Alexander’s is in a Grade II listed building at the top of Skipton high street and is picture perfect with its Grand Tour style. They opened their doors after an 18 month refurb last Summer (2017) and the decor is spot on. 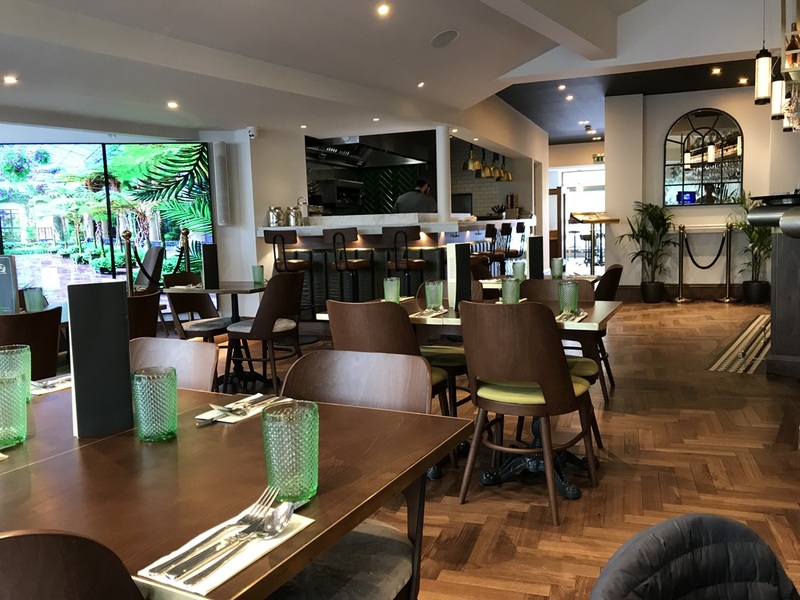 The open grill style kitchen and modern/classic bar made it all seem very on trend whilst still being warm and welcoming. They have a great outdoor space too with an under-cover area and outdoor heaters – which looked perfect for summer, but there were people enjoying the outdoor area when we were there on the chilliest of April days. Look out for some events coming to that outside space over the summer months too. 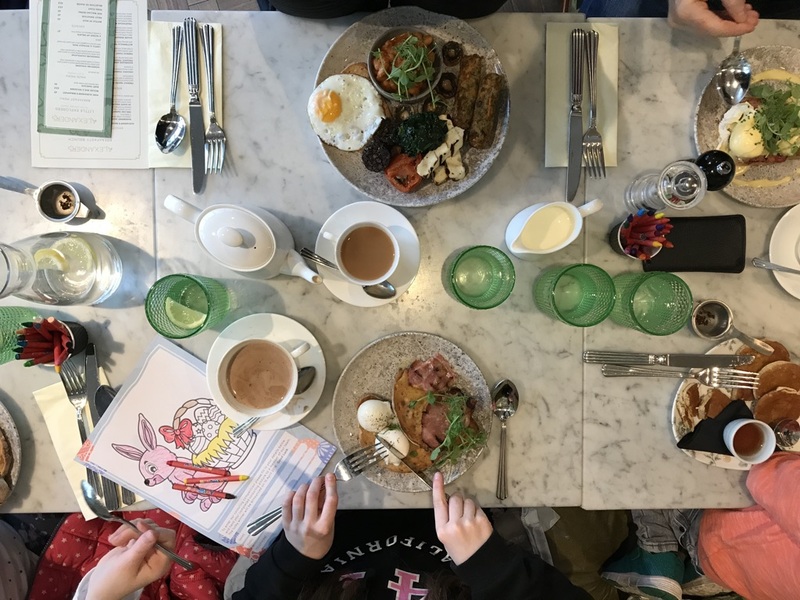 The Smalls were made to feel really at home with great colouring and a perfect children’s menu too. The choice for the grown-ups was excellent too – with lots of decisions to be made about what to go for, which is not always the case as a veggie! 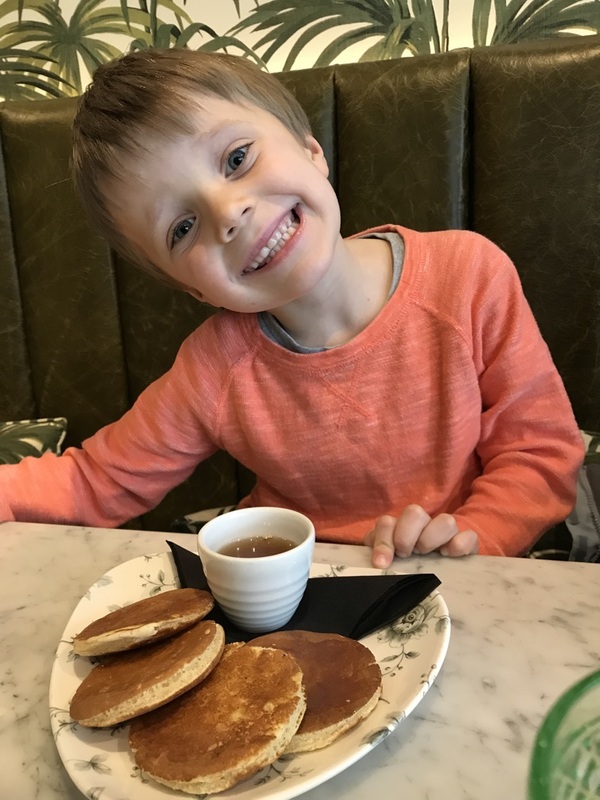 The Small Boy rather predictably chose the baby pancakes served with banana and maple syrup (with his banana was on the side). 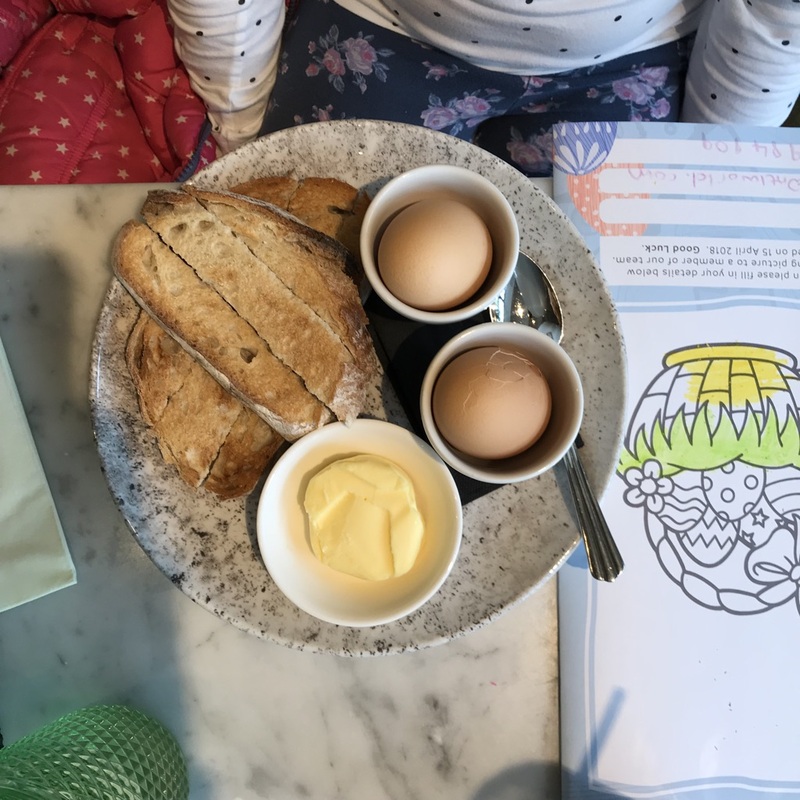 One of the Big Girls chose the kids boiled egg and soldiers which were cooked perfectly with some awesome toast. From just £3.50 we thought the kids menu was really good value. 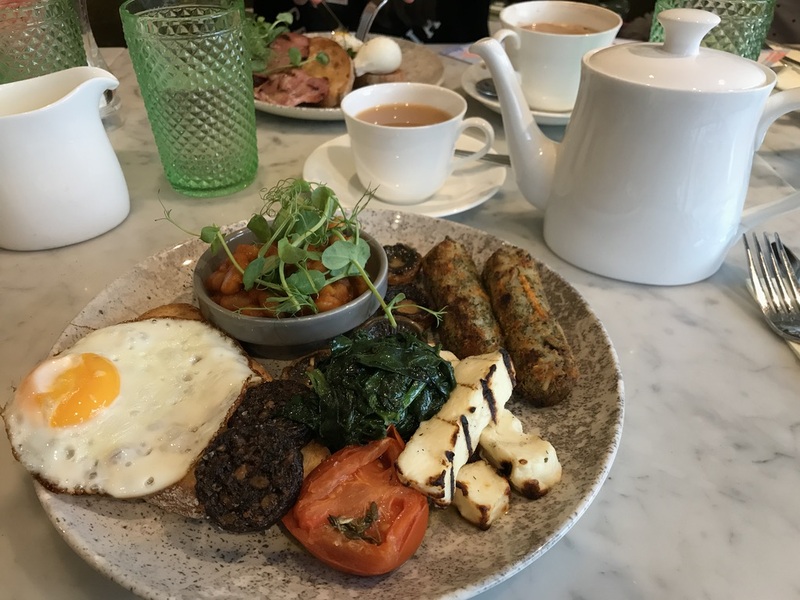 I opted for the vegetarian breakfast which included eggs (your way) grilled halloumi, vegetarian sausage (made from vegetables and not pretend meat), portobello mushrooms, vegetarian black pudding, homemade baked beans, roast tomatoes and sourdough toast. It was delicious and all cooked perfectly and I didn’t need to eat again pretty much all day! Ha! 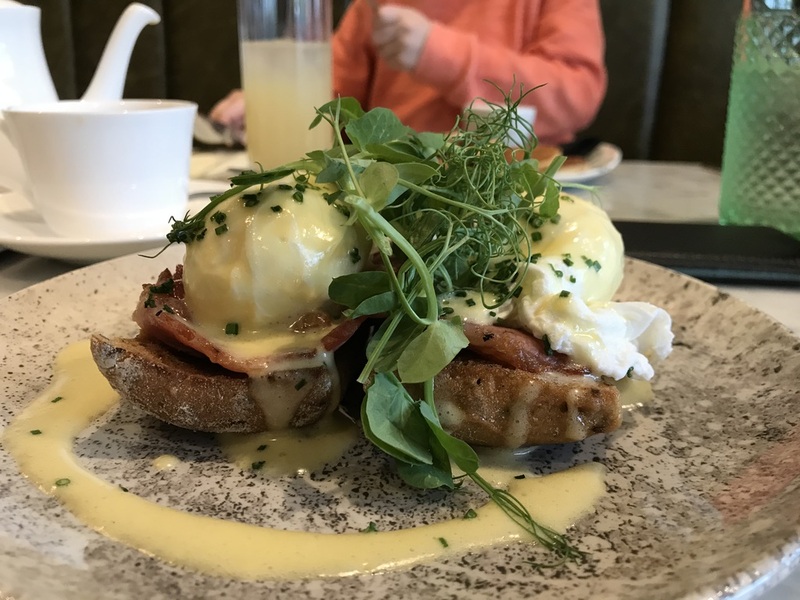 Harrogate Papa went for one of the options from The Benedicts range, which included variations on the classic eggs and hollandaise with smoked salmon, spinach and nutmeg or the traditional ham. He chose his to be served with bacon and it went down a storm, he keeps reminding me, even now, he’d quite like to eat that again soon! 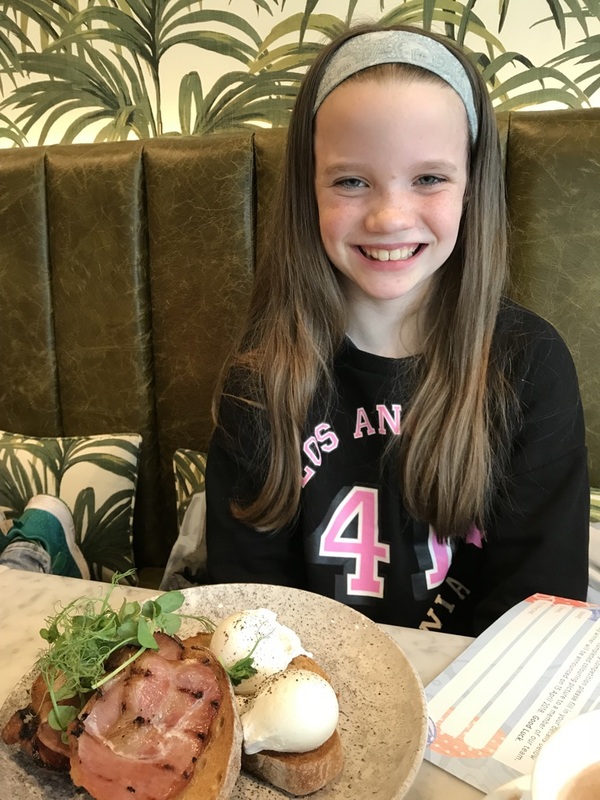 Poached eggs served with dry cured smoked streaky bacon was the choice of Big Girl number two and for just £8 was a great price, she loved it and polished it off in no time. All in all the food was a huge success and there were clean plates all round. The Smalls had fresh fruit juice each and one chose a hot chocolate which came with a choice of being made from four chocolates ranging from dark cocoa to white and vanilla. Quite the hot chocolate connoisseur! The details in the decor were smart but relaxed and you could see why it’d be lovely for cocktails or evening dinner with the grown-ups as well as more family friendly meals too. We loved it and will definitely be back next time we’re heading Skipton way. 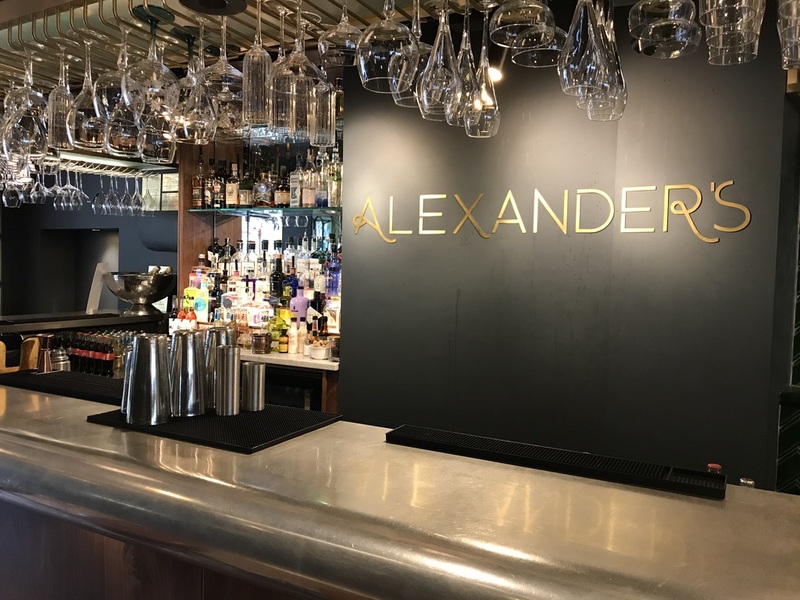 To find out more you can check out Alexander’s website – they have a host of special events coming up too including their monthly Gin and Jazz event and a Royal Wedding afternoon tea on 19th May. 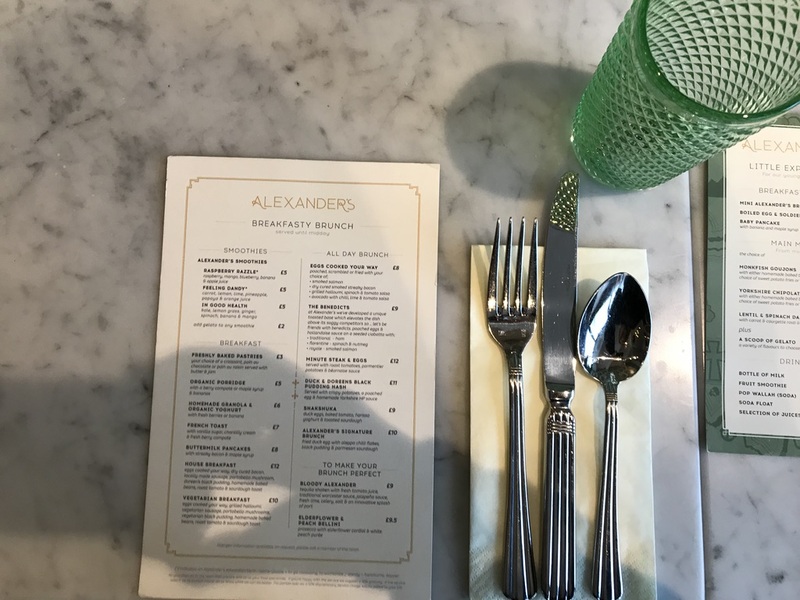 – Many thanks to Alexander’s for inviting us in to review – the thoughts are all my own.